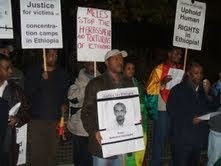 Ethiopians, friends of Ethiopia and human rights activists staged a vigil on November 1, 2007 in front of the Ethiopian Embassy in London to commemorate those massacred, imprisoned and disappeared innocent citizens following the disputed May 2005 election. The demonstrators demanded the Ethiopian regime to stop its outrageous actions in Ogaden and expressed their deep sorrow over the tragic events taking place in the region and their solidarity to those suffering from these inhumane actions. The demonstrators also requested the tyrannical regime of Ethiopia to unconditionally release Daniel Bekele and Netsanet Demissie, human rights activists detained for two years without verdict. It is to be remembered that the kangaroo court in Ethiopia adjourned the trial of Daniel Bekele and Netsanet Demissie for 22 November, 2007. Mr. Daniel Bekele and Mr. Netsanet Demissie are human rights activists detained in Ethiopia since November 2005. Daniel Bekele, 40, was head of Policy, Research and Advocacy at Action Aid Ethiopia. Prior to his latest post, he had worked as a lawyer and played active roles in the Ethiopian Bar and the Ethiopian Women Lawyers Associations. Daniel graduated from the Addis Ababa University with a BA degree in Law in 1989. He obtained a Masters degree in 2001 with concentration on Development Studies and later won a Master’s degree in legal research at Oxford University in the United Kingdom. Daniel worked on different capacities including Global Goal to action against Poverty and was a member of the executive committee of an NGO network monitoring the contested parliamentary elections of 15 May 2005. He was arrested on November 1, 2005 and accused of outrage against the Constitution and the constitutional order. The court adjourned his trial for 22 November, 30 Nov, and subsequently for 24 Dec. 2007. Nestanet Demissie, 29, was a co-founder and Chief Executive of the Organization for Social Justice in Ethiopia (OSJE) that aimed at fostering Democracy through Education, Policy Making and Advocacy. Prior to the founding of OSJE, he served as a co-director and editor of The Ethiopian Legal Directory's annual publication. He was an assistant judge in the civil bench for two years. He had also co-written a National Civic and Ethical Education Text for students from 10-12th grade. Netsanet graduated from the Addis Ababa University with a BA degree in Law and did further studies in Peace and Conflict Transformation in Austria. Netsanet worked on the Global Call to Action against Poverty in Ethiopia. He hosted the Secretariat and played a leading role in the NGO network monitoring the contested parliamentary elections of 15 May 2005. Netsanet was arrested on November 8 2005 and is charged with outrage against the Constitution and the constitutional order. The court adjourned his trial for 22 November, 30 Nov, and subsequently for 24 Dec. 2007. Amnesty International has called the two human rights activists as prisoners of conscience. We urge peace loving people all over the world to call upon the Ethiopian government to release the detained Human Rights Activists without any condition. "Injustice somewhere is injustice every where." Justice shall prevail in Ethiopia.